DSMC, The Department of Sacred Music and Communications is the official music department of the Marthoma Syrian Church. Musicians are ministers appointed by God and music for worship is not our entertainment. It is an act of worship (I Chronicles 16:4-6). While many choirs learn to sing with musical excellence, which is very important, few musicians take either the congregation or the choir beyond the esthetic level into the spiritual realm. Choir members are to prepare themselves to be the leaders in corporate worship. 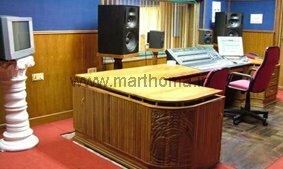 We are equipped with a world class sound recording studio in our campus. Our studio is powered by Pro Tools HD (Hi-Definition) with Degidesign’s C 24. Apart from all of our own productions we do prestigious, outside major recordings also. Every year we bring out 12 – 15 albums of Christian Hymns including Sunday School, Yuvajanasakhyam and Sevikasanghom competition songs from Kristeeya Keerthanagal.